*On May 13, 2012, TNA held Sacrifice. TNA Knockouts Champion Gail Kim retained against Brooke Tessmacher after a great back and forth match up. Brooke Tessmacher held her own against the champion, even having Gail's number plenty times throughout the match, at one point she hit Gail's Eat Defeat. Brooke's tactics would go nowhere as Gail pinned her with the feet on the ropes assisted roll up for the three count. The new Mrs. Robert Irvine(married May 10, 2012) is a week shy of becoming the longest reigning TNA Knockouts Champion. As much as I love Gail Kim, her becoming longest reigning champion is not going to matter, when you have Angelina Love who has held the championship on five different occasions. We all recognize Gail as the first-ever TNA Knockouts Champion, and that title will be with her forever, but in my opinion TNA dropped the ball once again. TNA held a great oppurtunity to crown a new champion that their Impact crowd is behind. At this point Gail Kim does not need the championship around her waist she is that established as a competitor, the Knockouts division needs a breath of fresh air, every week it seems that I see the same match week to week. Brooke Tessmacher has proved to everyone that has doubted her that she can hang with the best of them in the ring. With her biggest match of her career just days away, Brooke told DivaDirt in an interview that winning the Knockouts Championship would mean “That [I’ve finally] proven to the people that doubted me, or people that go, ‘Oh she’s just a model’ or ‘Oh she’s just gonna come and go’ – it’s gonna prove that I’m here to stay. It’s going to prove that I am a real threat. It’s going to prove that I am a threat in the Knockouts division and all of those girls should worry every time they step in the ring with me. And it’s going to prove that I’m finally a real professional wrestler. That I’m not just a model.” Well Brooke did just that. In case you didnt know Brooke had little in ring experience during her WWE days. Since stepping back into the ring in 2011, the former TNA Knockouts Tag Team Champion has shown improvement through training with sessions with bff Tara and proven to be a threat to the division after taking on the likes of Mickie James, Velvet Sky, and Madison Rayne. Hopefully TNA continues this storyline between the two of the narcissistic champion vs the underdog. Gail Kim is set to defend her TNA Knockouts Championship in a triple threat match on TNA Impact this week against Brooke Tessmacher and and former champion Velvet Sky. *CHIKARA has two events this weekend to celebrate their ten year anniversary. First up is "Aniversario: A Horse of Another Color" on Saturday May 19, 2012 with Saturyne teaming up with Eddie Kingston, Soldier Ant and Scott Parker to take on the team of "The Queen of Wrestling" Sara Del Rey, Shane Matthews, Green Ant and Jigsaw. There will also be joshis in action that night as Meiko Satomura teams with Kagetsu against Dash Chisako and Sendai Sachiko. The next night (May 20, 2012) at CHIKARA's "Aniversario: The Ogg and I," up and comer Saturyne takes on another up and comer Kagetsu. There will also be inter-gender tag team action as Ring of Honor's The Bravado Brothers take on the sister duo of Sendai Sachiko and Dash Chisako. The final match for the card is a match that was originally scheduled for JoshiMania back in December 2011, Meiko Satomura takes on "The Queen of Wrestling" Sara Del Rey. 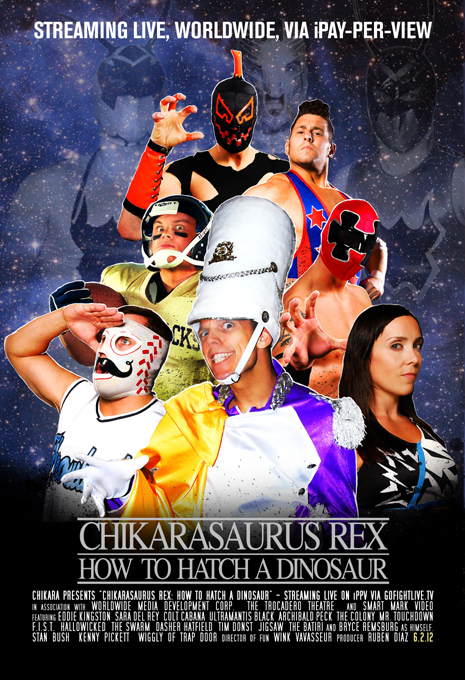 CHIKARA has also announced that an Intergender Handicap Bout will take place on their June 2, 2012 IPPV, "Chikarasaurus Rex:How to Hatch a Dinosaur" with "The Queen of Wrestling" Sara Del Rey teaming with Saturyne to take on the Batiri(Obariyon, Kodama & Kobald). *Universal Women's Pro Wrestling or REINA held its final show at the Korakuen Hall on Saturday May 12, 2012. Formed over a year ago by Riki Tamashiro, Yumiko Hotta and Aki Kanbayashi, REINA showcased joshis and luchadoras from Mexico through their working agreement with CMLL. Mia Yim, Courtney Rush, Portia Perez, Nicole Matthews, Luscious Latasha, Ray, Simply Luscious, Sara Del Rey, Kellie Skater, Tomoka Nakagawa, Gabby Gilbert, Kimber Lee, Zeuxis, Silueta, Yumiko Hotta, Mima Shimoda, and La Commandante and so many more names have all competed in REINA. The promotion hosted many matches for both CMLL Women's Championship and CMLL National Women's Championship. REINA would later host their own championships with Aki Kanbayahi and Saya being the last REINA World Tag Team Champions and the CMLL-REINA International Junior Championship, a championship that was meant to be held by women with ledd than ten years experience, being officially retired on May 13, 2012 making Silueta the second and last champion. At this moment no one knows for sure why the promotion abruptly decided to close up shop. The chances are this is another case of finances, its take a pretty penny to finance all the cross promotion between Mexico and Japan, let alone affording talent. REINA had a number of upcoming shows booked and announced going up to Christmas Eve. The cat was let out the bag when Ray, Ice Ribbon, SMASH, REINA regular revealed that REINA was no more via Twitter: “I was surprised at the dissolution of REINA, but it gave me the opportunity to fight lots of overseas stars and go to Mexico. I will be forever grateful. Happiness to everyone.” If this dissolution of REINA is permanent then this is disappointing, REINA gave alot of new talent an oppurtunity to perform on an international stage and helped provide more flavor to the dying joshi scene. *With nCw Femmes Fatales IX coming up on July 7, 2012, Courtney Rush has made out a special challenge for WSU's The Midwest Militia. The challenge has been accepted! * Back in DivaLand, WWE has set up their Divas match at Over the Limit with Beth Phoenix challenging the current champion Layla for the championship. Over on NXT, Maxine defeated "The Warrior Princess" Tamina, Maxine is still stuck with Johnny Curtis. Natalya finally picked up a win on WWE Superstars after defeating the ever so foxy Alicia Fox in what I believe is their bext match up against each other to date. AJ defeated her now former bff Kaitlyn on Smackdown after attacking her like a hell cat, somebody hand her some damn prozac. After defeating Kaitlyn in a mere twenty second match, AJ's beau Daniel Bryan came out and told AJ that they will never be an item and that he is moving on to Kaitlyn. The funny thing is WWE has this match for the WWE Divas Championship coming up with in less than a week and they dont try to build any interest in this match what so ever besides a thirty second tag team match on RAW which Beth Phoenix did not participate and a quick interview with "The Glamazon" on WWE Backstage Fallout, and WWE wonders why no one cares about the Divas division. WWE has four shows throughout the week and we only see the champion and the challenger on one show last week. This week on RAW Beth Phoenix defeated Alicia Fox in a quick three minute match, WWE Divas Champion Layla attacked "The Glamazon" after the bout. Hopefully this is not the only appearance from both ladies this week, since the Over the Limit PPV is Sunday. *Brittney Savage says she wants the WSU Championship. Women Superstars Uncensored(WSU) announced that they have been brought by an independent buyer. WSU has promised to release more details of the new ownership this week as well as the state of the company. I'll have more details when I get them. WSU has also released two new DVDs, the "J-Cup 2012 Tournament" and "WSU presents Y.O.L.O" you can purchase these DVDs and more at WSUvideo.com. *Tickets for nCw Femmes Fatales IX are now on sale. Femmes Fatales VIII DVD is also on sale. *Pro Wrestling: EVE's Shanna is out of action with a torn ACL. "Portugal's Perfect Athlete" has surgery on her ACL last Monday and is looking to return sooner rather than later. *Natalya def Alicia Fox on WWE Superstars(May 10, 2012). *Brooke Tessmacher def Velvet Sky on TNA Impact(May 10, 2012). *AJ def Kaitlyn on Friday Night Smackdown(May 11, 2012). *REINA(May 12, 2012): Hikaru Shida & Tsukasa Fujimoto def Basara & Saya/ Aki Kanbayashi def Kimber Lee/ Mima Shimoda, Ray, Tomoka Nakagawa def Goya Kong, Zeuxis, Dalys La Caribena/ Mexican National Women's Championship: Princesa Blanca(c) def Lady Apache/ Kyoko Inoue & Saree def Aoi Ishibashi & Mia Yim/ Hair vs Hair Falls Count Anywhere Street Fight: Yumiko Hotta def La Commandante. *Gail Kim(c) def Brooker Teassmacher at TNA Sacrifice(May 13, 2012). *Beth Phoenix def Alicia Fon on WWE RAW(May 14, 2012). *Gail Kim vs Velvet Sky va Brooke Tessmacher on TNA Impact on May 17th. *Kay Lee Ray vs Jenny Sjodin at Acid City Championship Wrestling on May 18th. *Nikki Syxx vs Sara Del Rey at New York Wrestling Connection on May 18th. *Melanie Cruise vs Chazz Moretti at POWW on May 19th. *CHIKARA: "Aniversario: A Horse of Another Color" on May 19th: Meiko Satomura & Kagetsu vs DASH Chisako & Sendai Sachiko/ Saturyne, Eddie Kingston, Soldier Ant and Scott Parker vs Sara Del Rey, Shane Matthews, Green Ant and Jigsaw. *Jessicka Havok vs Reby Sky at Crossfire Entertainment on May 19th. *Velvet Sky vs Sassy Stephie at Remix Pro Wrestling on May 19th. *Io Shirai & Keira vs Vaquerita & Chika Tormenta at Lucha Fan Fest on May 19th. *Layla vs Beth Phoenix at WWE Over the Limit on May 20th. *CHIKARA's "Aniversario: The Ogg and I": Sendai Sachiko & Dash Chisako vs The Bravado Brothers/ Meiko Satomura vs Sara Del Rey/ Saturyne vs Kagetsu on May 20th. *Big Time Pro Wrestling's LadyMania on May 26th. *Shazza McKenzie vs Kellie Skater at New Horizons Pro Wrestling on May 26th. *Su Yung vs Angel Blue at ACW on May 27th. *AKIRA, Dave Finlay & Syuri vs Kana, Tajiri & Mikey Whipwreck at Wrestling New Classic on May 27th. *Amber vs Annie Social vs Barbie vs Brittney Savage at Pro Wrestling Syndicate on June 1st.